Hong Kong: China's first operational aircraft carrier has arrived in Hong Kong for the first time today in a display of military might less than a week after a high-profile visit by president Xi Jinping. Xi's trip marked 20 years since Hong Kong was handed back to China by Britain, and analysts said it left little doubt that Beijing viewed the city as a destabilising hotbed of unacceptable political dissent. His three-day visit culminated in a 30-minute speech warning that any challenge to Beijing's control over the city crossed a "red line", seen as a salvo against a new wave of activists calling for self determination or independence, concepts intolerable to Beijing. President Xi also inspected 20 squads of troops last Friday at the city's biggest military parade in the past two decades, where helicopters and armoured vehicles were displayed. The 305 metre-long (1,000 feet) Liaoning, a secondhand Soviet ship built nearly 30 years ago and commissioned in 2012, arrived in the city at around 7:30 am. The country's national defence ministry had said the Liaoning, named after a northeastern Chinese province, was part of a flotilla on a "routine training mission". It would mark the 20th anniversary of China's People's Liberation Army (PLA) entering the city, defence ministry spokesman Wu Qian told reporters last Thursday. Enthusiasm for the aircraft carrier was high with people queueing overnight at the PLA garrison in central Hong Kong for public tour tickets earlier this week. But ticket-holders are banned from bringing cameras when they board the aircraft carrier on Saturday, reports said, while foreign media outlets have not been invited to cover the event. Authorities have also set up a temporary no-fly zone in the area where the Liaoning will be berthed near the city's Tsing Ma suspension bridge. After the handover in 1997, some feared the PLA would be heavy-handed given the army's crackdown on student protesters in Beijing's Tiananmen Square in 1989. Instead they have maintained a low profile and are barred from interfering in local affairs. 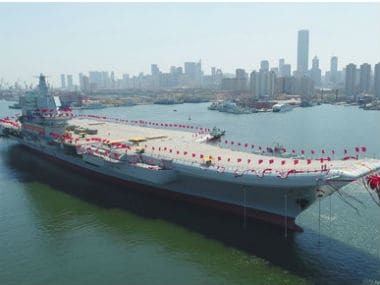 China launched its first domestically built aircraft carrier in April, but it is not expected to enter service until around 2020 once it has been fully equipped and armed.